There is currently just the 1 ferry route running between Bornholm and Poland operated by 2 ferry companies – Polferries & TT Line. The Ronne to Swinoujscie ferry crossing operates weekly with a scheduled sailing duration from about 5 hours 30 minutes. Whilst we’ve taken great care to ensure the information on this page is correct, as the frequency and duration of crossings on all routes can vary from time to time we’d advise that you get a live quote for current availability on this Bornholm Poland crossing between Ronne and Swinoujscie. The Danish island of Bornholm lies 200 kilometres east of Copenhagen in the Baltic Sea and is renowned for having the sunniest climate in the country. 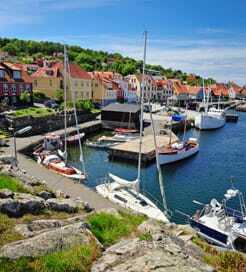 Known locally as the ‘pearl of the Baltic’, Bornholm Island is blessed with one of the finest natural landscapes in Scandinavia, comprising sandy beaches, dramatic chalk cliffs and lush forests. It also boasts picturesque harbours, windmills and fascinating fortress ruins. Due to its isolated location in the Baltic Sea, travelling by ferry is a convenient mode of transport to the surrounding Nordic nations. Bornholm’s main port is in Ronne on the west coast, where there are numerous routes provided to mainland Denmark, Sweden and Germany, making it a useful gateway to Western Europe, too. The port is served by Route 38 from the east and Route 159 from the north, so it’s within easy reach from most locations on the island.